When you’re looking for an alternative to a pink food color for a cake or cupcakes, check out Strawberry Puree. It’s made from pure strawberries and it makes a lovely pink cake color. It’s perfect for any dessert that needs a little hint color and naturally a mild strawberry flavor. But don’t stop there, you could use this puree in a lot of different ways! 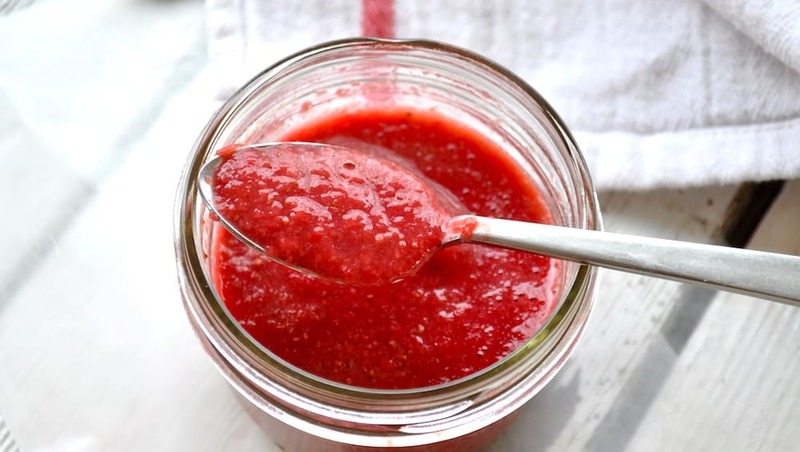 If you only have raspberries well try my easy Raspberry Sauce recipe, it will not disappoint! Can you use Frozen Strawberries to Make Strawberry Puree? YES! You can even use frozen strawberries in this recipe. I would recommend it too, save those gorgeous fresh strawberries for snack or lunches! But if you have fresh berries and need a puree, use them!  I like to lean heavily on frozen berries just because we live in Alaska and frozen berries are a pantry staple. You get fresh berries here you’re paying enough you should eat them fresh. All my humble opinion I know, do what you will! What can I use Strawberry Puree for? 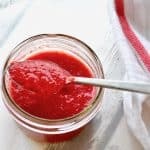 You can use this strawberry sauce for a yogurt or ice cream topping, on top of cheesecake or in margaritas or daiquiris. I’ve used for part of the liquid in cupcakes or cakes, try that out first before attempting for company or parties, it works differently in different recipes! Use to decorate dessert plates too, that always looks so beautiful! It’s perfect for babies although it could be kind of messy. Or eat it with a spoon when no one is looking. That last one is my favorite form of enjoying treats! 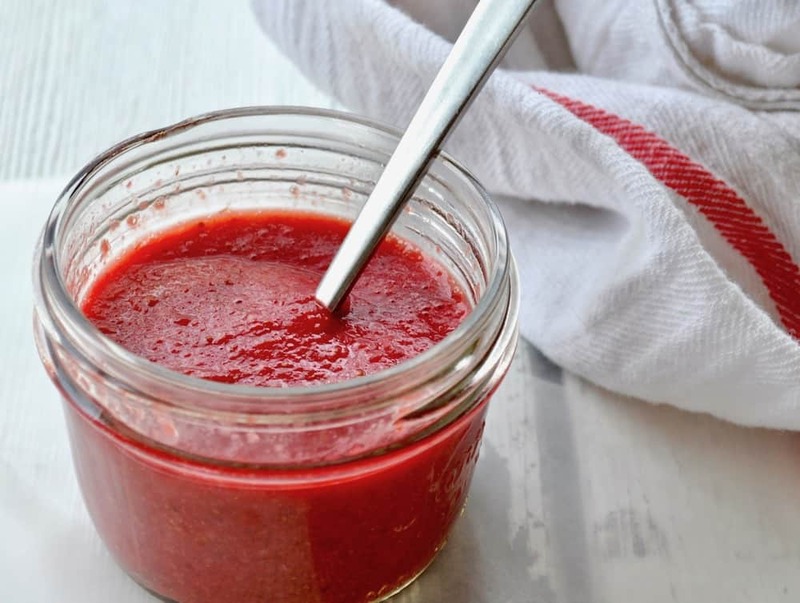 You make this sauce from strawberries and a little water, and that’s it. I hesitated even to write it up, but I realized that some people might be making it harder on themselves than they need to! Don’t make it hard, use my simple method and keep it simple. When you're looking for a natural alternative to a pink food color for a cake or cupcakes, check out this easy to make Strawberry Puree. Mmmm! I want to put that on everything! I love strawberries. Now I am curious what you used it for!